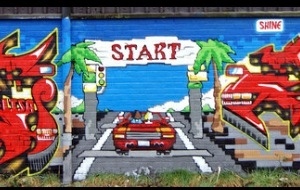 This week I came across some pretty amazing OutRun street art that was posted on Flickr around two years back. It’s based on the SEGA Master System version of OutRun. I believe the art was located in the U.K somewhere in Kent. The only graffiti experience I have is playing SEGA’s Jet Set Radio, so I’m not sure what the hell it says but the artwork is sweet! The artwork mentions a few names who may of been involved in creating the art -: Ante_up, Shine & Quest. This entry was posted in Custom made OutRun, Outrun, OutRun Art and tagged #outrun, outrun art, outrun graffiti by OutRun 1986 by TAGGSTA. Bookmark the permalink.